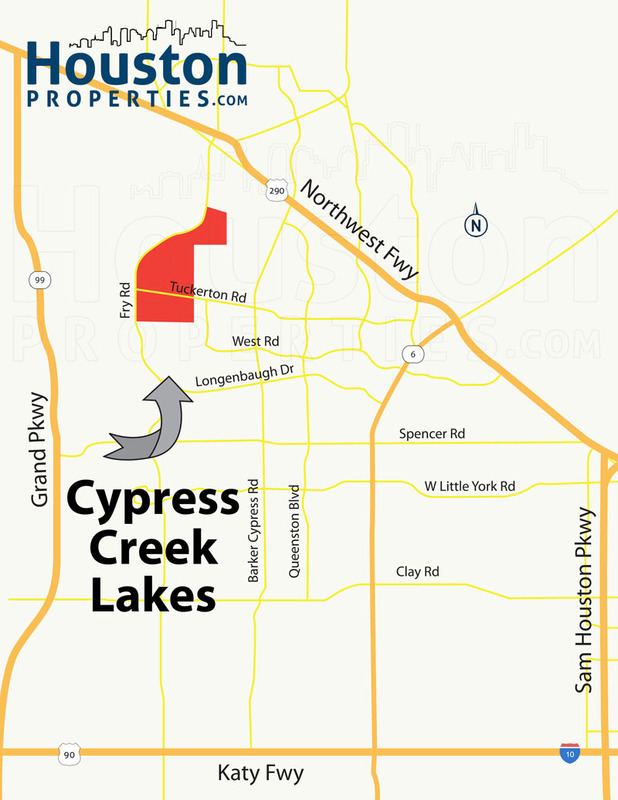 Master-planned community Cypress Creek Lakes is located about 24 miles northwest of Downtown Houston. Covering a 1,600 acre area, Cypress Creek Lakes is located along Fry Road, east of Bridgeland. Cypress Creek Lakes was named as “Best Overall Community, Over 20 Acres” by the Texas Association of Builders and “Quality Planned Development” by the West Houston Association. The community is under Mischer Development, and is slated to be finished by 2019. Cypress Creek Lakes will have over 2,100 homes once completed. Like nearby Bridgeland, Cypress Creek Lakes’s master plan includes preserving the area’s natural beauty. Cypress Creek Lakes homes have easy access to Highway 290, Grand Parkway, and I-10 via Fry Road. The community’s amenities includes recreation centers, splash pads, parks, hike-and-bike trails, and a clubhouse with a fitness room. Planned lakes and lush surroundings give Cypress Creek Lakes homes great views and a serene atmosphere. Zoned to the highly rated Cypress-Fairbanks Independent School District, Cypress Creek Lakes residents attend Warner Elementary, Smith Middle School, and Cypress Ranch High School. Retail and entertainment centers are within minutes of Cypress Creek Lakes homes for sale. The Shops at Cypress Creek Lakes is home to a number of stores, restaurants, and other commercial establishments. Like most master-planned communities in and around Houston, Cypress Creek Lakes offers a wide variety of homes with different designs, floor plans, and price points. Homes within Cypress Creek Lakes typically start at $200,000 to well over $700,000. I am interested in Cypress Creek Lakes and would like to get more details. Beautiful and serene, Cypress Creek Lakes is a master-planned neighborhood located east of Bridgeland, some 24 miles northwest of Downtown Houston. Known for its lakeside homes, the community is a peaceful, 1,600-acre enclave. Cypress Creek Lakes homes are centrally located, with schools, parks, activity centers, retail and entertainment hubs, and restaurants nearby. The Cypress-Fairbanks Independent School District has an on-site campus housing Warner Elementary School, Smith Middle School, and Cypress Ranch High School. The Shops at Cypress Creek Lakes is the community’s 30,000 square foot retail center, and features several retail stores and other commercial establishments. 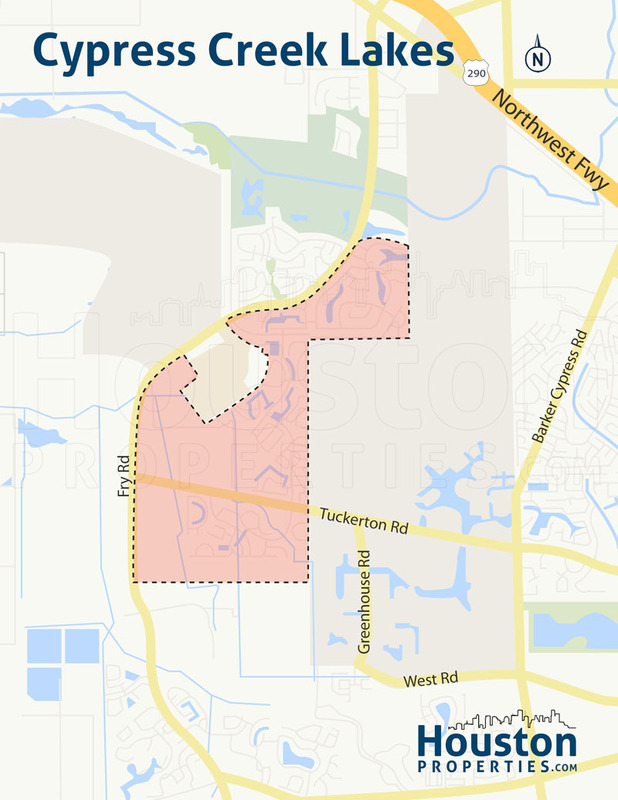 Mischer Development estimates Cypress Creek Lakes to be built out by 2019, with more than 2,100 homes. Well-known builders, like Perry Homes, Lennar, and Ashton Woods, offer different home designs, varying in size, floor plan, and style. Smaller Cypress Creek Lakes homes for sale can feature around 2,000 square feet of living space, a 3/2 floor plan, on a 7,500-square foot lot. The most expensive homes in the community, on the other hand, can feature as many as 6 bedrooms, 4 and a half bath, and garage space for three cars. These Cypress Creek Lakes luxury homes can offer a sprawling 27,000-square foot lot and more than 6,000 square feet of living space. Paige works with a tremendous number of buyers and sellers within Cypress Creek Lakes.